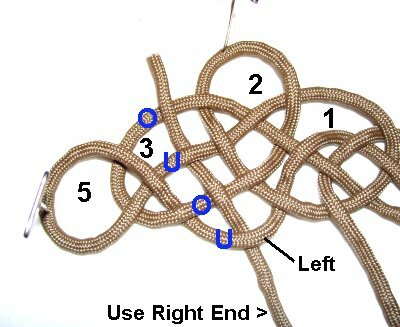 Description: The River Knot represents the sun rising over a rippling river. 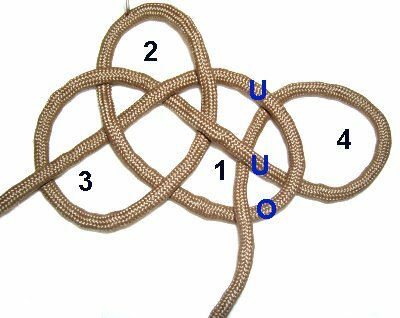 It starts out with the Josephine knot, which is a historical knot often used to form other types of decorative knots. You could use this design as the focal point for a Macrame bracelet or belt, since the ends come out at the sides. 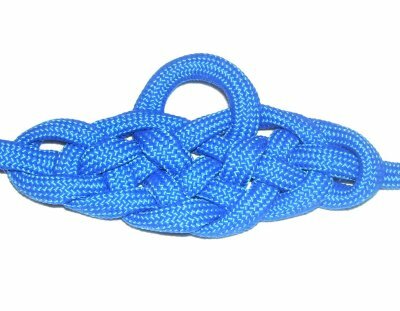 A wide pendant can also be made with this knot. You would finish off the ends and then add a new cord for the necklace (at the top). The material used in the example is Paracord, which needs to be prepared and finished by melting the tips with a flame. Click on the link or image to visit his website. 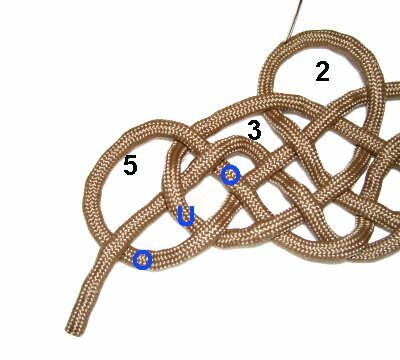 See the video gallery, which contains tutorials for many unique and interesting decorative knots. Step 1: Secure the center of a 60-inch cord to your board. Use the left half to make a counter-clockwise loop, passing under to form the crossing point. Bring the right half down, over the middle of the first loop. Bring it back up moving clockwise. Pass it under the left end, to complete loop 2. 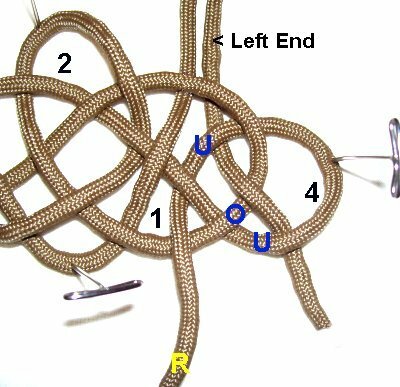 To make loop 3, weave the right end clockwise through loops 1 and 2 over - under- over - under. Balance the three loops, but don't tighten. Step 2: Move the end on the right (near loop 1), to make loop 4. 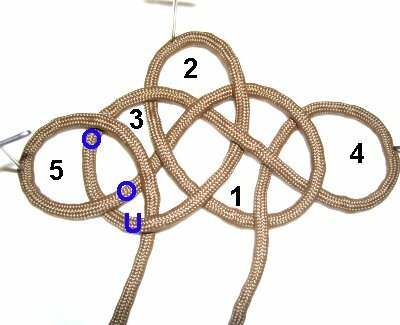 Weave under - under - over the three segments of loop 1, rotating counter-clockwise. Step 3: Make loop 5 using the end on the left (next to loop 3). Pass it over - over - under the three segments, rotating clockwise. Step 4: Push loop 4 to the right, so there is space between it and loop 2. Weave the left end through the middle of loop 1, passing under - over - under the three segments. Step 5: Bring the left end back down and to the right. Weave it through loop 4, under - over - under the three segments. Step 6: Push loop 5 to the left to create a space between it and loop 2. 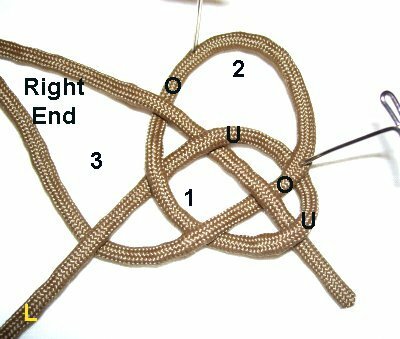 Pass the right end under the left at the bottom of the River knot. Weave it over - under - over the three segments of loop 3, heading towards the top. Step 7: Curve the right end back down and to the left. Weave it over - under - over the three segments at Loop 5. 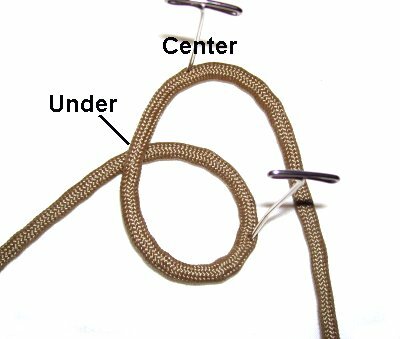 Step 8: Tighten the River Knot gradually, removing the slack from the loops in the order they were made. 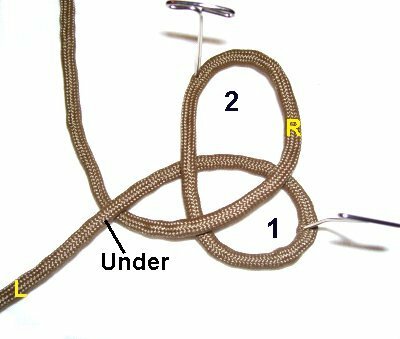 Secure the ends to the back or use them to make other knots. 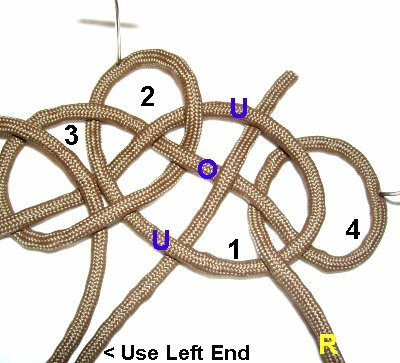 Have any comments about the River Knot? Contact Me.